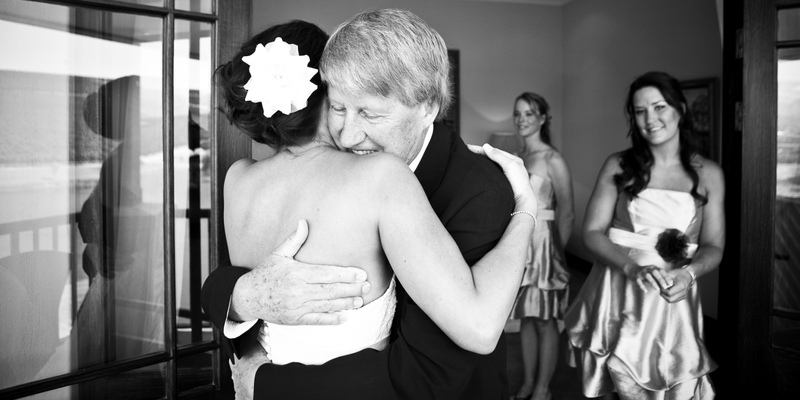 In the beautiful speech he gave on our wedding day my dad said, “I wonder if you will ever know what a pleasure it has been to be your father.” It was a moving moment that, thanks to his wonderful gift with words, everybody felt, and I will never forget. And yet – I did know. I knew, because my dad made sure I did. Every day, he made sure I knew he loved being my dad. My childhood is filled with memories of early mornings at the kitchen table as he read to me before school, horsing around the living room rug at night, and weekends in the pool as he threw us up in the air over and over and over again. The hours I spent with him in his workshop, sanding old bits of wood so I could watch him build things; the spirited games at the dusty pinball machine in the garage and the driving lessons where he never lost his cool; the bike rides and card games and the dance lessons he used arrive early to fetch me from so he could sneak in and watch the last few minutes. He effortlessly walked a line that fathers of daughters have to tread – that I am watching the father of my own daughters find for himself now. A friend but a parent first. The indulger but also the disciplinarian. The praiser but critic when needed. The fun one who is also able to kiss better scraped knees and bumped heads. The guy who wouldn’t let me get my ears pierced or paint my toenails, and who told my teenage self to go right back upstairs and change when I came down in a skirt that was too short. I look back on my childhood and I see that my dad, alongside my amazing mother, did so much more than parent me through the wilderness years. He gave (and continues to give) me the greatest gift – a blue print for what being loved – really ferociously loved – looks like. A blue print for what being a husband and a dad looks like. A blue print for what I want from the man in my life. Now I get to watch my own daughters with the man in their lives – their first love. In a world where bad things happen every day, where there is violence and anger and uncertainty and cruelty, I’m so grateful that the first important relationship of their lives – the one they have with their dad – is pure and lovely and kind and full of fun. I’m grateful for the belly laughs between them, their little secrets I’m not privy to, the looks that pass between them and the utter devotion in the way they look at each other. There is so much still to come, and I know that this is the relationship above all others that will set them up for the rest of their lives. The guy who comes along one day will have a lot to live up to in their eyes – which is exactly as it should be. So Dad – the pleasure has been all mine. Just found your beautiful blog and this post about you and your dad has brought a tear to my eye. You should put up a health warning! My Dad has a very special place in my heart too for many of the reasons you describe but I am unfortunately, at that time in life, that in my 30’s I didn’t see coming. Little boys who have grown or are growing into young men, independent of me as much as they can be and parents, getting older and slowly losing their independence in ways I never imagined. My lovely Dad was diagnosed with Parkinsons Disease nearly 2 years ago. Most of the time things are fine but they’ll never be quite the same again. I’ve learnt that we should cherish every memory, so well done you, it looks like you’ve learnt that lesson already. Thank you for your lovely story.